Used 1975 Chevrolet Corvette 3992 Org Miles NCRS Top Flight L82 4sp Org Docs! for Sale in Indiana PA 15701 AutoSport Co. Trim: 3992 Org Miles NCRS Top Flight L82 4sp Org Docs! 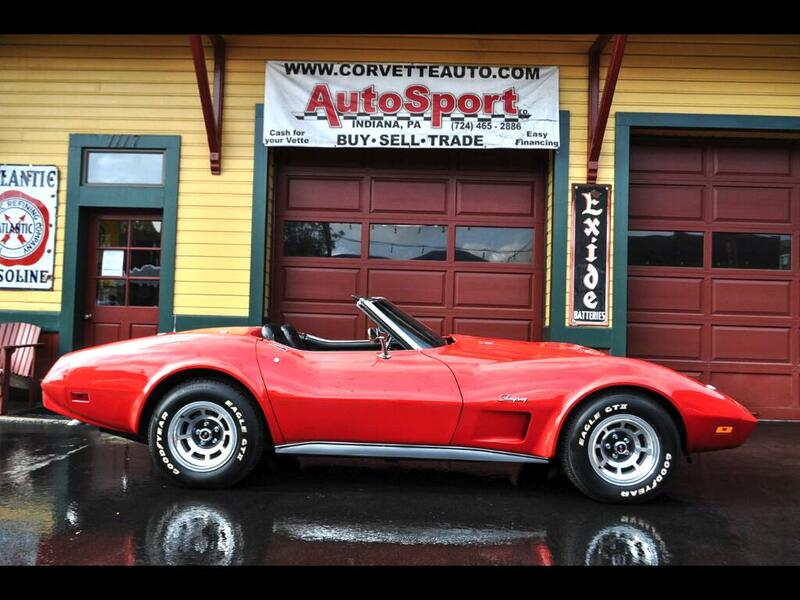 1975 L82, 4sp NCRS Top Flight Award Winning Milli Miglia Red Corvette Convertible with 3992 original documented miles! We are proud to offer this rare Corvette that has just recently been awarded Top Flight Status by the NCRS. Documentation includes the original Window Sticker, original title of the car, original owner’s manual, original pamphlets, NCRS Top Flight Certificate, NCRS Judging Sheets, and NCRS Top Flight Blue Ribbon. This is not a typo it has 3992 original miles!!! The Milli Miglia Red paint is in excellent condition for its age. The NCRS could not believe it was original, but when it was highly scrutinized it was determined that it is Lacquer paint and there was some respray work that was done at the factory. There is overspray in places that could only be done at the factory. The bumper covers were replaced because the original rubber bumper covers were cracked and falling apart. We have pictures of the car with the original bumper covers. The exterior of this car is amazing. The white soft top is the original dated convertible soft top. The interior is the original Leather interior from the factory and it looks new. This cars interior is in fantastic condition is second to none. The engine compartment is in excellent condition with its original L82 engine. The rest of the driver train, 4-speed trans and rear axle are original. The frame and undercarriage are original. There are original stickers on the half shafts and the driver shaft from the factory, there are original stencil numbers and marks from the factory all over the undercarriage including the transmission. I was the first person to ever drop the spare tire on this car at the NCRS meet, and it still has the blue film on the white letters from the factory all the original markings are on the spare wheel from the factory and the original jack tools are there. From the spare never being removed it was stuck to the carrier and the letters can been seen on the fiberglass. This car is impeccable and is sure to go on and achieve many more awards and trophies. The factory options are; L82 Engine, 4-Speed Transmission, Milli Miglia Red Paint, Deluxe Black Leather Interior, White Top, Tilt-Tele Steering Column, Power Steering, Power Brakes, AM-FM radio, White Lettered Tires, and Aluminum Wheels installed at the dealership. There is a much more to go over on this car, its history and how it managed to stay in such condition with hardly any miles on it! Please feel free to call us at 814-977-9219 or email us with any questions.